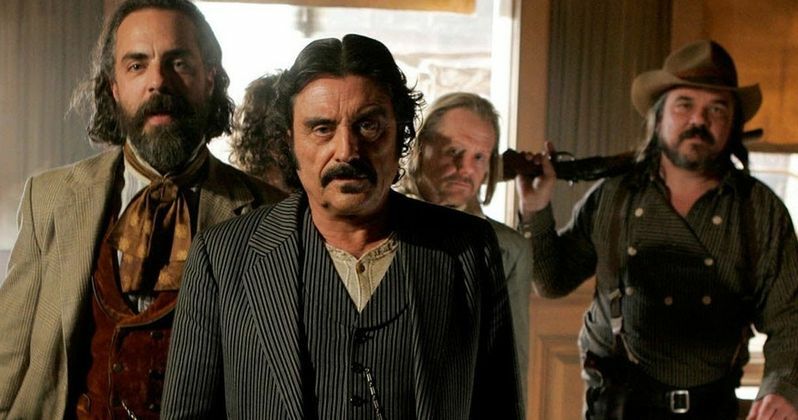 This August will mark the 11th anniversary of a very sad date in TV history, the last episode of Deadwood, which was unceremoniously canceled after its Season 3 finale. Given the massive fan base for the show, many had been holding out hope that the show would come back in some way, and in January 2016, those fans' prayers were answered when the network gave the green light for a new Deadwood movie. We reported in April that series creator David Milch has delivered his script to HBO, but we haven't heard anything since then. Today we have word from Ian McShane, who said that the movie may in fact shoot before the end of the year. Variety spoke with Ian McShane, who was promoting his new hit series American Gods on Starz, when the talk eventually shifted to Deadwood. The last update we had on the movie was last month, when series star W. Earl Brown revealed the script was both thrilling and heartbreaking. When asked about the possibility of this movie actually happening sometime soon, Ian McShane had this to say. "There are signs that HBO are quite keen to make it. They've got the script. It's when they'll make an offer and when we can fit it in. We probably won't start American Gods until probably the end of the year or early next year, so there's a window when we can do Deadwood, but they need to get everybody together. I mean all the characters that David Milch wants to put in the show. I'm probably going to have breakfast with him later this week. But no, they're keen to do it, and I'm sure it would seem not only artistically a perfect time to do it but also commercially because there's always been a revised interested in Deadwood. It went off the air far too soon for all the reasons you say, but that's a long time ago. It seems like a two hour film would be a nice thing for all the people that want to see it and all of us who were deprived of the gig too early." While no specific details about the script have been revealed quite yet, the movie will be missing two beloved cast members who have passed away. We reported the tragic news last month that the iconic Powers Boothe, who played Cy Tolliver on the hit series, died in May, and we reported in October 2015 that Ralph Richeson, who played the peculiar cook named Richardson on the hit series, passed at the age of 63. Since Powers Boothe passed after the script was delivered, it remains to be seen if he was originally written into the story, or if series creator David Milch will pay homage to their characters in some way during the movie. This Deadwood movie is said to give a definitive ending to the Deadwood series, which fans were deprived of when HBO canceled the series in 2006. While no characters have been confirmed yet, the ensemble cast included actors such as Timothy Olyphant (Sheriff Seth Bullock), John Hawkes (Sol Star), Molly Parker (Alma Garret), Robin Weigert (Calamity Jane), Brad Dourif (Doc Cochran), Leon Rippy (Tom Nuttal), Paula Malcomson (Trixie), Sean Bridgers (Johnny Burns), W. Earl Brown (Dan Dority), Dayton Callie (Charlie Utter), Jim Beaver (Ellsworth), William Sanderson (E.B. Farnum), Kim Dickens (Joanie Stubbs), Jeffrey Jones (A.W. Merrick), Titus Welliver (Silas Adams), Anna Gunn (Martha Bullock), Garret Dillahunt (Francis Wolcott), Bree Seanna Wall (Sofia Metz), Brent Sexton (Harry Manning), Brian Cox (Jack Langrishe) and Gerald McRaney (George Hearst). Hopefully we'll hear more about this long-awaited Deadwood movie soon.